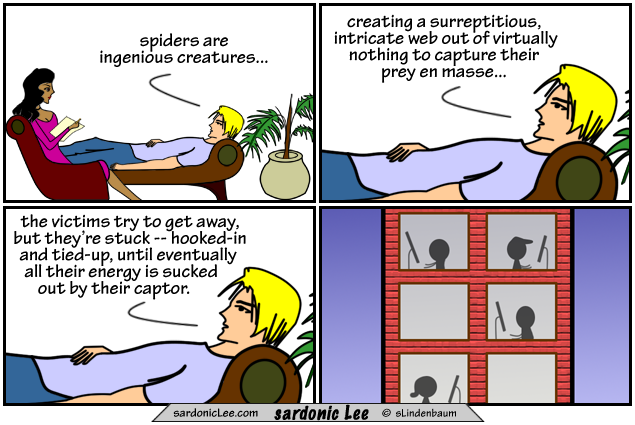 those captured by the web turn into zombies, and web-resistent bugs will rule. What has 8 hairy legs and scares the $%#@ out of me? Four guys from the IT department! This web spins for eternity and those spiders do not die when stepped on, they just get stronger. Do vain spiders get spider veins? not sure, but here’s a useless odd fact… ‘vain’ means both conceited and worthless. Oh what an f-ed up web we’ve weaved.